Most people are aware of some aspect of the arts and culture of the golden age of Spain, including the exploration that lead to Europe’s stumbling upon the Western hemisphere, but these objects tell us so much more and allow us to understand better what is perhaps the least known country in Western Europe: a country that is challenging to know because of its complexity, but worth the adventure into the conflicted crossroads of Europe and the Americas. 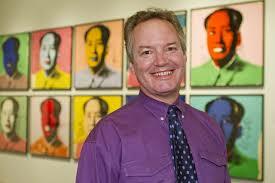 Andrew Connors is Director of the Albuquerque Museum. Previously he served as Chair of the Visual Arts Department at Albuquerque Academy, as Senior Curator at the National Hispanic Cultural Center in Albuquerque, and as Associate Curator at the Smithsonian American Art Museum where he developed collections and exhibitions on Hispanic, Latino, Native American, and Folk Art. He studied Art History and Architecture at Yale University and pursued his PhD in Folklore and American Studies at George Washington University. He has curated dozens of exhibitions primarily in the areas of United States Latino Art, Colonial Art from Puerto Rico, Contemporary art, and Graffiti. He is currently working on an exhibition and book on the history of jewelry in New Mexico from prehistory to the present, the first exhibition in a series of medium-focused historical survey exhibitions on New Mexican art which will include ceramics, and textiles. As a lecturer, guest teacher, or consultant, he has worked with numerous organizations including the National Gallery of Art, Smithsonian Office of Folklife Programs, Institute for Latino Studies at the University of Notre Dame, Chicano Studies Department at the University of California Los Angeles, Getty Center for Education in the Arts, and the Royal Government of Bhutan.